Our Parma Ham 18 month mature whole deboned is a naturally air dried ham produced in the area around the city of Parma in the foot hills of the Appenine mountains, whose clean air enhances the taste and aroma of the meat. Here you will also find our 18 month mature Prosciutto di Parma 100 gram servings, hand sliced to order on our vintage slicer , packed in traditional waxed deli paper. We also have diced parma ham which is a much leaner option than using pancetta for sauces and stews and for your parma ham recipies all our authentic Italian parma hams are available to buy online. Parma Ham Diced-Once we get to the end knuckle of one of our delicious Parma hams and we cant slice any more we seal the last piece in the vacuum packer, and.. 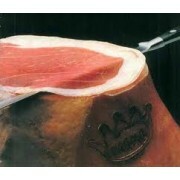 This is the true king of all air cured charcuterie, beautiful moist Parma Ham Reserva from Emilia-Romagna, also the home of Parmigiano Reggiano.Only the finest ..
An original de- boned leg of Prosciutto di Parma carrying the famous five pointed crown stamp. Weight never less than 7.5 kilos. Prosciutto di Parma is a natura..